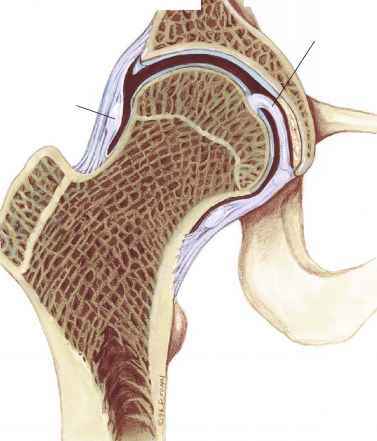 Figure 29-2. Tissue microarray construction and analysis. Tissue specimens embedded in paraffin blocks are sampled with a metallic punch,and the tissue cores are transferred to an empty paraffin block to produce a tissue microarray. 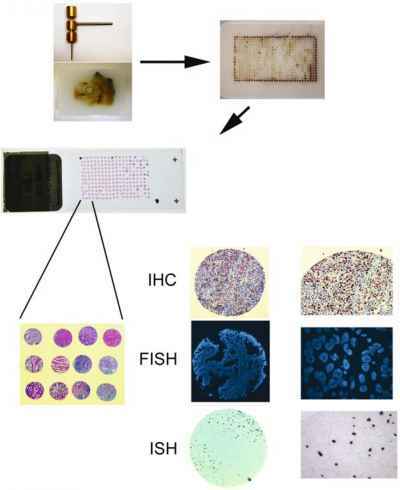 Sections taken from the tissue microarray block will contain sections of all the sampled tissues, which can be studied simultaneously by immunohistochemistry (IHC), in situ hybridization (ISH), or fluorescent in situ hybridization (FISH). Temecula, CA). The construction of a TMA (Figure 29-2) involves assembling a paraffin block containing hundreds of tissue cores (0.6 mm in diameter) derived from different "donor" blocks. Since the cores are very small, minimal damage is done to the original block. The technology is based on precision micrometers, which move a needle (0.6mm to 2 mm in diameter) in the x- and y-axis. Micrometer drives are used to position the punch assembly with respect to the donor and recipient blocks. Once the TMA block is created, at least 50 histologic sections can be produced from the TMA block for either immunohisto-chemisty or in situ hybridization (fluorescent, radioactive, or nonradioactive probes).